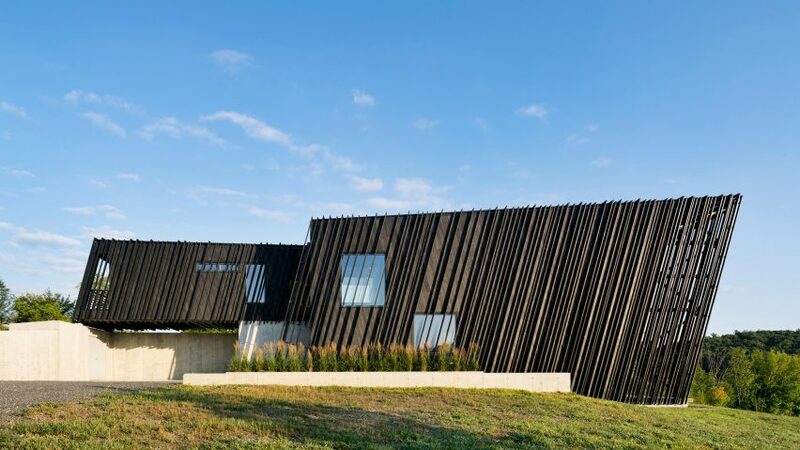 Designed and built by Actual/Office Architects, this vacation home in upstate New York consists of two nested volumes wrapped in angled screens made of blackened wood. The Sleeve House sits on a gently sloping site in the bucolic Hudson River Valley, about two hours north of New York City. Built as a speculative development, the residence is envisioned as a countryside retreat for art-collecting urban dwellers. Orthogonal in plan, the two-storey dwelling consists of a long, linear volume nested within a larger, wider volume. "Oriented in relation to the sloping terrain and views of the mountain ranges, the house is conceived as two elongated volumes – a smaller one sleeved into a larger – sitting on a cast-in-place concrete base," said Actual/Office Architects, or A/O, a Brooklyn studio led by architect Adam Dayem. "The project strives to create a striking appearance on the landscape and unique spatial experiences for its inhabitants, while also containing comfortable, livable domestic spaces." The volumes are wrapped in slanted wooden screens, giving the effect of a leaning house. The wood was charred using shou sugi ban, a traditional Japanese technique. "Boards of varying thickness and depth are placed flat and on-end to give the facades depth, pattern and texture," the team said. "The on-end boards run continuously as screens over windows on the long sides of the house to emphasise purity of the sleeved volumes. The short ends of both volumes are glass walls to maximise views of the surrounding landscape." Inside, an entry gallery and narrow staircase are placed in a slot between the inner and outer volumes. The kitchen, dining area, and living room are situated within a split-level zone featuring concrete stairs and partitions, and a ceiling made of blackened wood. A sloping glass wall offers views of the surrounding valley and mountains. "These spaces are on a grand scale and are finished with hard, rough materials, including exposed concrete and charred wood, which run continuously in from the exterior," the team said. Bedrooms, a bathroom and a study sit in the elevated smaller volume. More intimate in scale, the private spaces features soft materials such as carpet and drapery. "The experience of passing from these hard, large-scale spaces into the interior of the inner volume is like entering a different world," A/O said. The residence has a number of sustainable features, including a solar power system, radiant heating, triple-glazed windows, and a heat and energy recovery ventilation system. "The project is built to be as energy efficient as possible given the amount of glass in the design and, as a development project, the need to control up-front costs," said the studio, which added that this speculative project offers an alternative to the conventional architect-client relationship. "The project was realised as architecture and development. This model of design is seen to be more in the vein of other disciplines – product design, couture fashion, high-end automotive design – where an object of desire is delivered fully formed to the user." Architects also served as developer at nearby Hudson Woods, a development of Scandinavian-inspired cabins that was designed and built by Lang Architecture. Photography is by Michael Moran (OTTO).